Though the taiga is among the world’s most inhospitable habitats, a handful of hardy species find ways to cope with the cold and secure the resources they need. Owls are among these species thriving in the taiga. The taiga not only provides its resident owls with prey to hunt and trees for nesting, but it offers resources to seasonal and temporary owl visitors as well. The taiga, or boreal forest, is the largest terrestrial habitat on the planet. A wide swath of cold and seasonably wet forest, the taiga ranges through the United States, Canada, Russia, Sweden, Finland and Norway as it circles the northern hemisphere. Lying between the polar regions to the north, and the temperate forests and plains to the south, the taiga has enough moisture to support trees, but the cold temperatures prevent all but the most cold-tolerant conifers from inhabiting the area. The taiga receives most of its precipitation during the brief summer, but the ground remains damp year-round, as the water does not evaporate quickly at such low temperatures. The taiga holds abundant prey for owls of all sizes. Small owls hunt the many voles, mice and other rodents of the region, while larger owls often add rabbits and birds to their menu. Bank (Myodes glareolus), grey-sided (Clethrionomys rufocanus) and field voles (Microtus agrestis) are important prey species in northern Sweden, and their three-year population cycles affect the nesting success of owls in the region. In particularly harsh portions of the taiga, collared lemmings (Dicrostonyx ssp.) are sometimes the only common prey. Named for their long feathers suggestive of ears, long-eared owls (Aiso otus) use their real ears to great effect. In addition to having a staggered placement on their head, one of their ears is considerably larger than the other, allowing the birds to hear very acutely. Rather than building nests from scratch, long-eared owls use the discarded nests of other large birds. 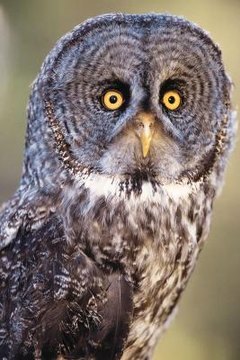 Great gray owls (Strix nebulosa) are the most iconic owls of the taiga. While possessing greater height and longer wingspans than any other North American owls, these large birds hunt small prey, such as voles and mice. Northern hawk owls (Surnia ulula) are smaller than some other taiga owls, but they make up for this with their incredible senses: hawk owls can see prey that is half a mile away. Pygmy owls (Glaucidium gnoma) are small, bird-eating owls that range into portions of the taiga. Given their small size and the cold climate, these little raptors must eat enormous quantities of food to keep their metabolisms burning. Northern saw-whet owls (Aegolius acadicus) also inhabit the periphery of the taiga. Instead of birds, saw-whet owls primarily prey on deer mice (Peromyscus ssp.) and other rodents. Some large species, such as snowy owls (Bubo scandiacus), also temporarily inhabit the taiga. Living there in the winter, some snowy owls migrate north in the summer and will travel great distances to find prey. More agile than other large owls, snowy owls can capture birds as large as geese when rodents are scarce. How Come an Owl Will Not Eat During the Day? What Are Some Cousins of Red-Tailed Hawks? What Is the Difference Between a Barn Owl & a Barred Owl?